Hi everyone! 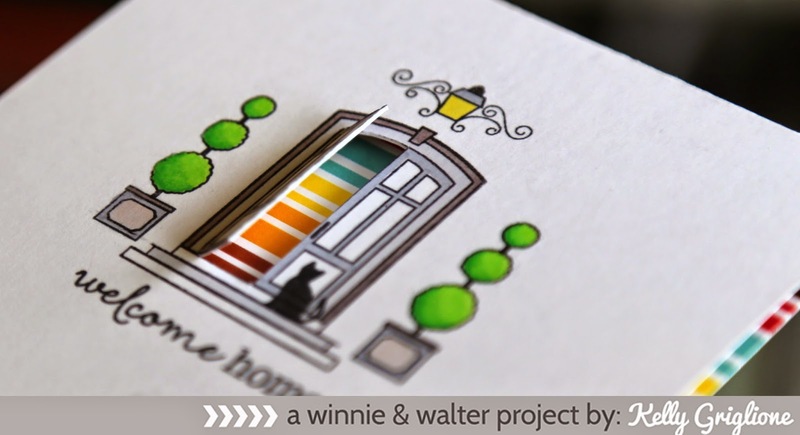 I am SO EXCITED for this blog hop debuting Winnie & Walter's stamp sets for August. I've been over-the-moon for their stamps since the beginning, along with many of you, and now they are totally kicking it up a notch with giant 6x8 sets that are chock full of all sorts of bits and bobs. You may have come from the much admired Joni Andaya's blog; are you ready to see some more from each of the sets?!? 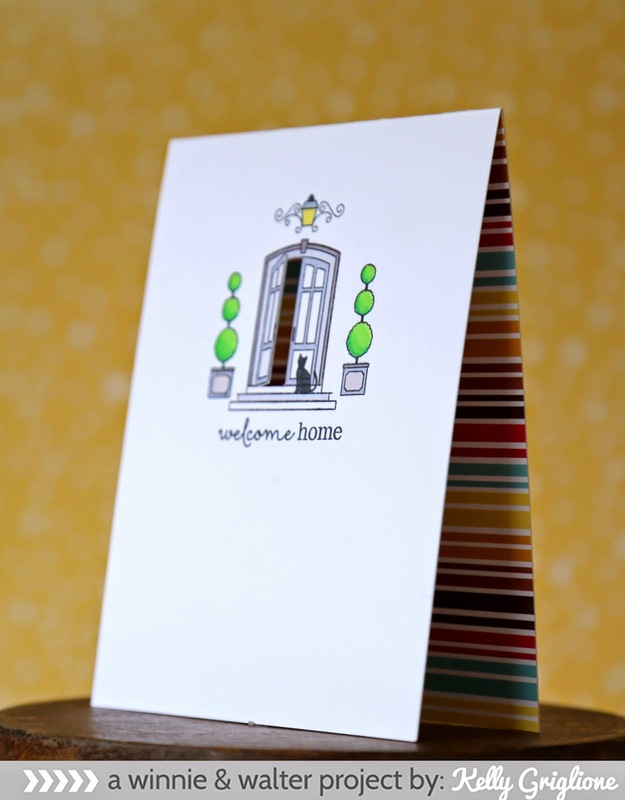 The first card is from This Awesome House, containing all the things you could possibly need to make a house-themed card. For this one, I skipped the house itself and just stamped a front door scene. The door opens to reveal the patterned paper on the inside. I just love that tiny cat!! And here's the actual house! It's a wonderful size ... big enough to really be the star on a card, or even just be the card itself! The steps extending beyond the bottom of the house make it stand nicely. 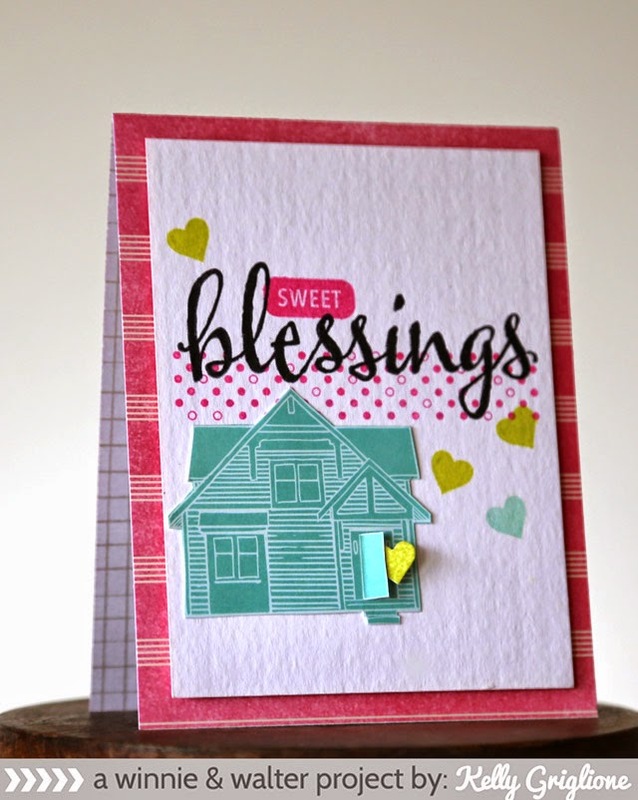 Love the spaces for the perfectly sized sentiments ... the roof, the middle, or both! 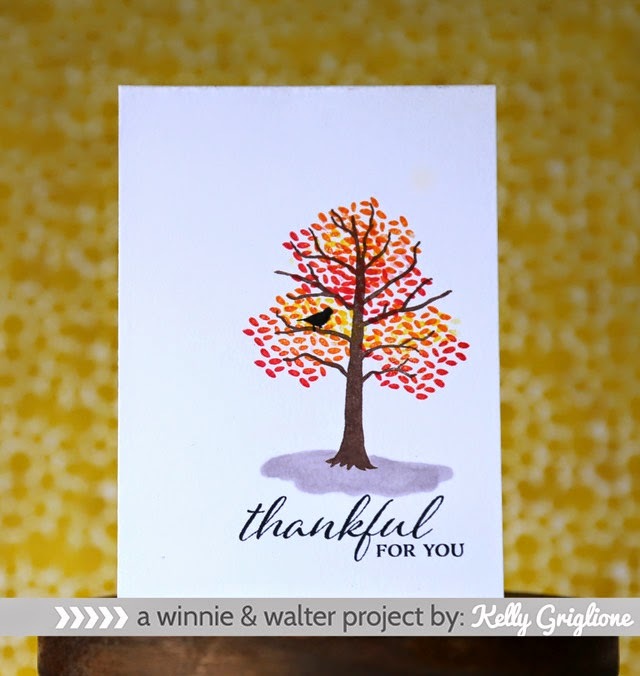 The next set, a Tree for all Seasons, contains the easiest way ever to make a colorful fall tree. The cluster of leaves was stamped four times, but doesn't look too repetitive. I inked the cluster in orange and then rolled the edges in red before stamping. Any spaces that were open when I was done were filled in with a cluster of yellow (partially stamped to fill the space). And the tiny bird is also a favorite, I think it gives more meaning to the sentiment. Here's another from that set. The sentiments are just gorgeous, don't you think? 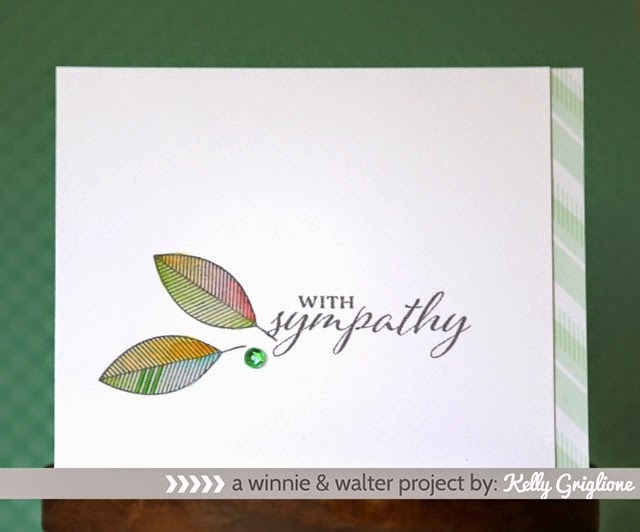 A super-easy card to make, the leaves were filled with a watercolor from distress inks. For a little interest, I colored three of the lines on one leaf. Can't get too crazy on a sympathy card! I even hesitated putting the one green sequin on. 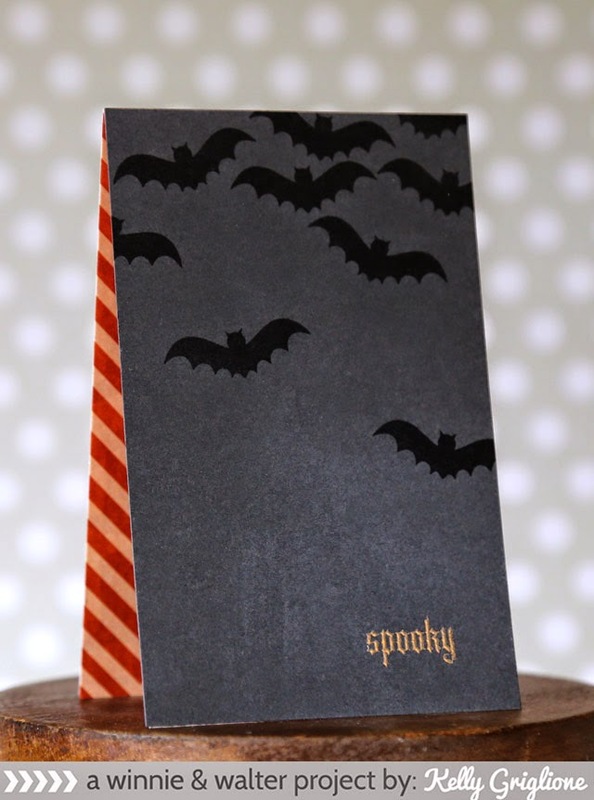 Finally, the Moonlight set has a million different images and sentiments for Halloween and more. I showed great restraint, and just stuck with one image and a sentiment. This would have been a great card for a 10 minute challenge. Simple stamping of the bat and an embossed sentiment, done. I like the message it sends though ... lots of bats flapping overhead like crazy and just a laid-back "spooky" observation. Before you move on to the next stop, you'll be happy to know that all three stamp sets are ready to be purchased now. If you order within the next 2 weeks, you'll get the coordinating digital elements for free. Also, there's lots of comment-to-win opportunities! 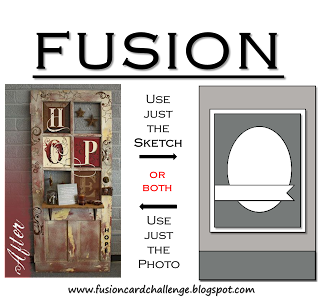 Each stop on the hop (including this one) will be giving away a winner's choice set from the August release to one random person who comments though August 31st. How awesome! OK, now off you go to the lovely Laura Sterckx's blog. It's so great having her on board for this release! I can't wait to see what she, and the others have created!! 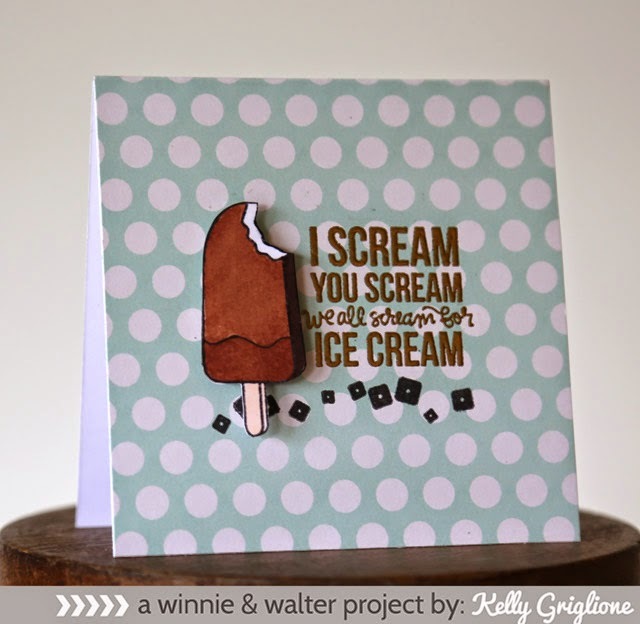 Like the other challenges this week, I'm using the Simon Says Stamp Ice Cream Dream set. 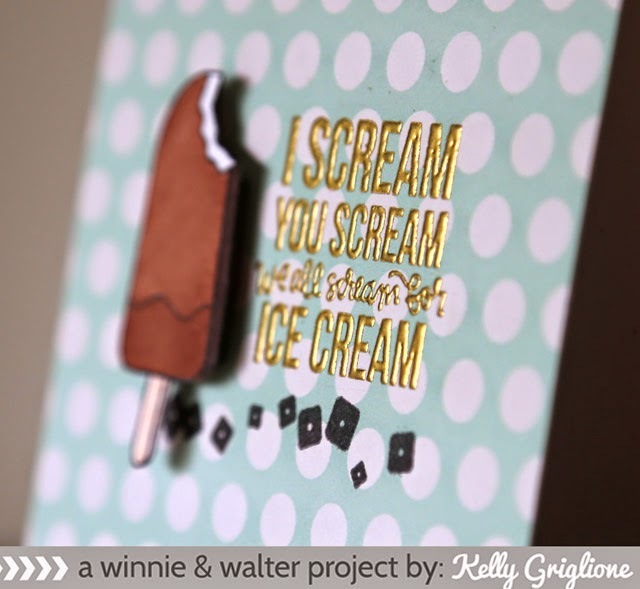 But unlike the other challenges, I'm using the background stamps and "sweet" sentiment, and not the ice cream images. It's a new-house card for my friends who moved away a couple weeks ago. 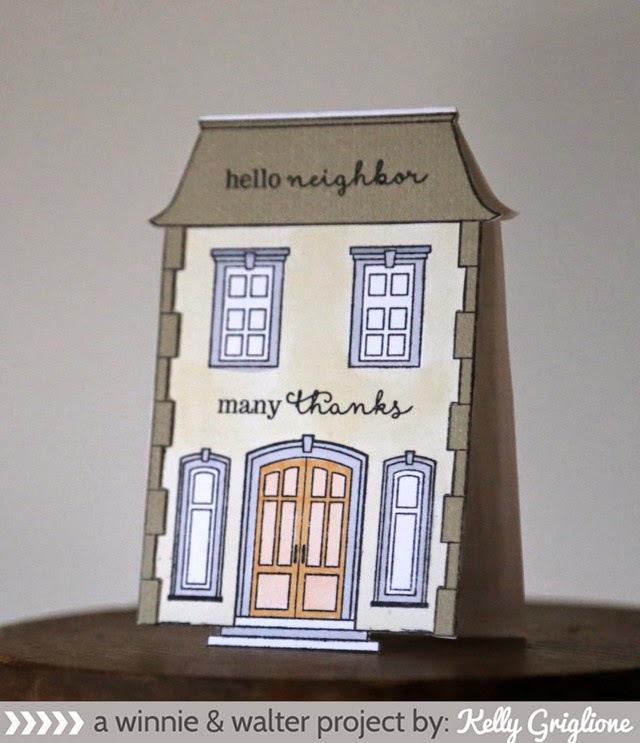 The house is cut out from Dear Lizzy 5th & Frolic paper. I used an exacto to cut the door out and then added one of the w&w hearts flying out. Also used my stash of mis-printed wedding invitations that a co-worker gave me 20 years ago ... love the thickness and texture to the white paper. Stop back tonight for the amazing August Release blog hop for Winnie & Walter ... we'll be showing all the new sets in one post! I'm dying to see what everyone has created!! Welcome to another fun Fusion Challenge! Have you seen the photo inspiration?! The patterned papers are actually from one 12x12 sheet of paper that had a bunch of journalling cards and spaces on it. It's a great way to get a bunch of coordinating patterns without too much effort. The papers are Dear Lizzy Polka Dot Party. 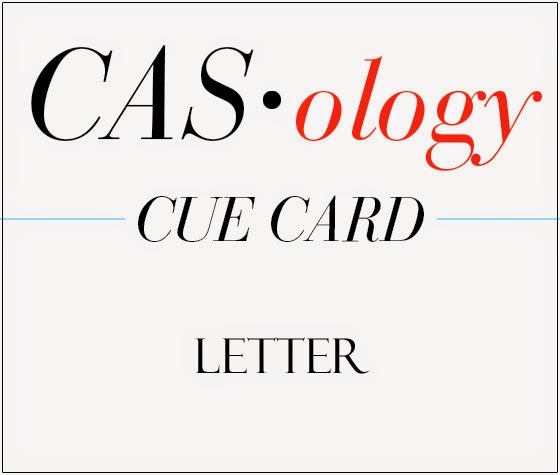 This challenge also fits nicely with the current CASology challenge of letter! Hi folks! 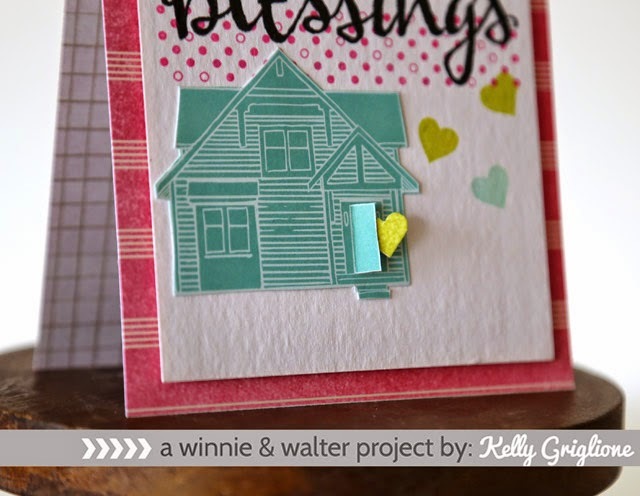 We're still sharing the love between Winnie & Walter and Simon Says Stamp, and today's challenge is to use a SSS set with a specific w&w set ... Scenery: Big Bang, Bling. 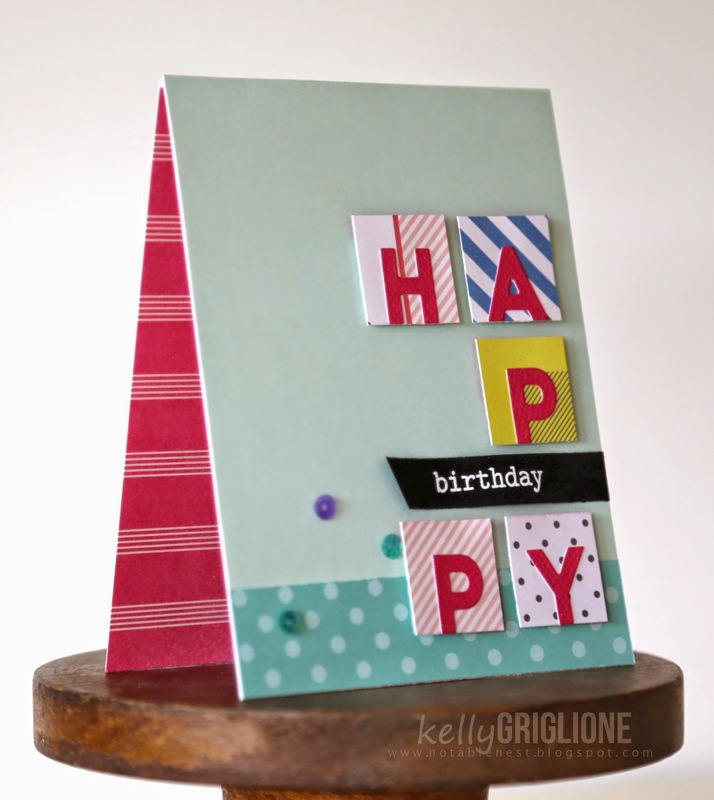 The squares, circles, asterisks, and sequins from the Bling set are great to use as a support to your sentiment. 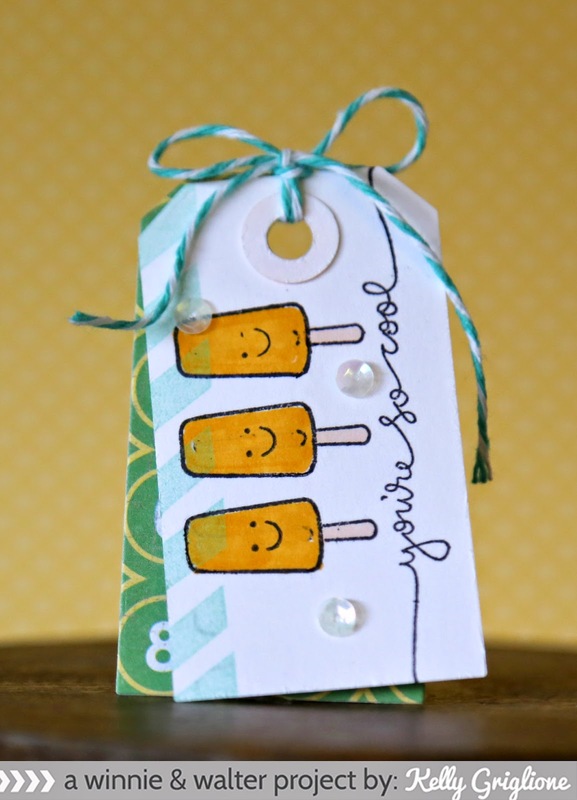 In this case, I really needed something to fill up the empty space between the bottom of the sentiment and the bottom of the Popsicle stick. This helps to make the group read as one square element. 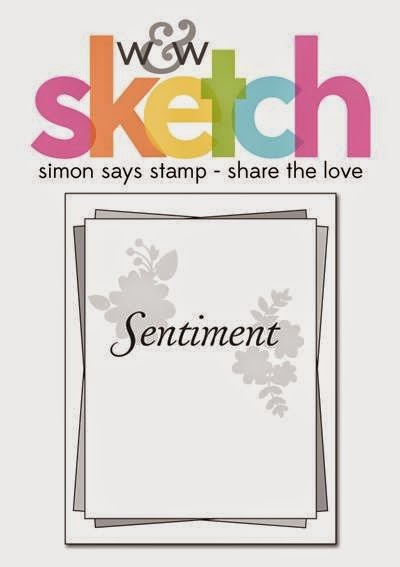 It was fun to stamp the sentiment right on the patterned paper background, and since the sentiment is so large and dense, I think it can handle it. The gold looks so luxurious with this font's thick letters. Stay tuned for another challenge tomorrow, and then I'll be back on Friday with the final challenge. 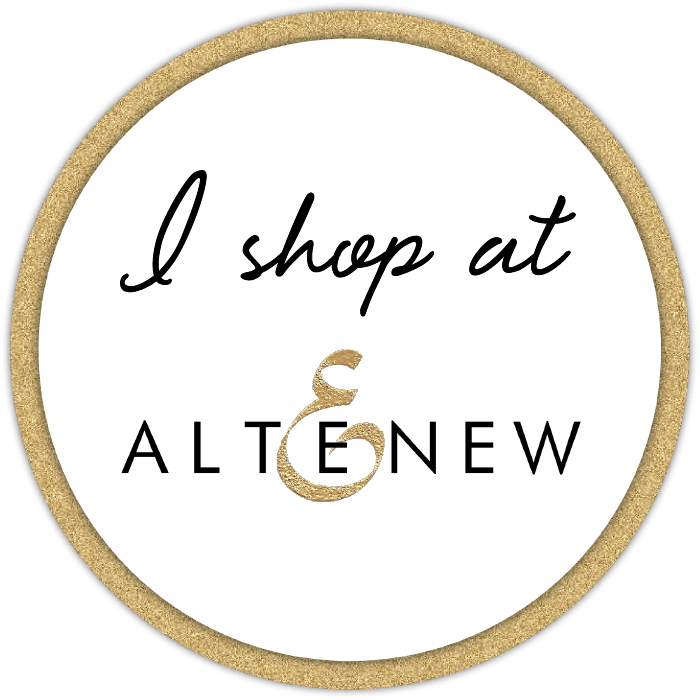 Hope you have some time to play along on the blog, or just check out the inspiration from Julie, Shay and my other super-talented teammates! Hi folks! Not sure if you've heard, but Winnie & Walter is pairing up with Simon Says Stamp every day this week with a fun, new challenge. One winner from each day will get a gift certificate to either Winnie & Walter or Simon Says Stamp!! Yesterday was a rainbow theme, and today is a 10 minute challenge. I used the small popsicle and only inked the outside portion, but the bottom inside portion also got inked by mistake. Since it was a 10 minute challenge, I had to move on!! 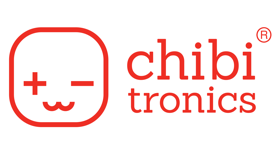 It ended up working OK when I added the smiley face ... they are now chins! Not sure if you noticed, but the last popsicle is winking. Hahaha. 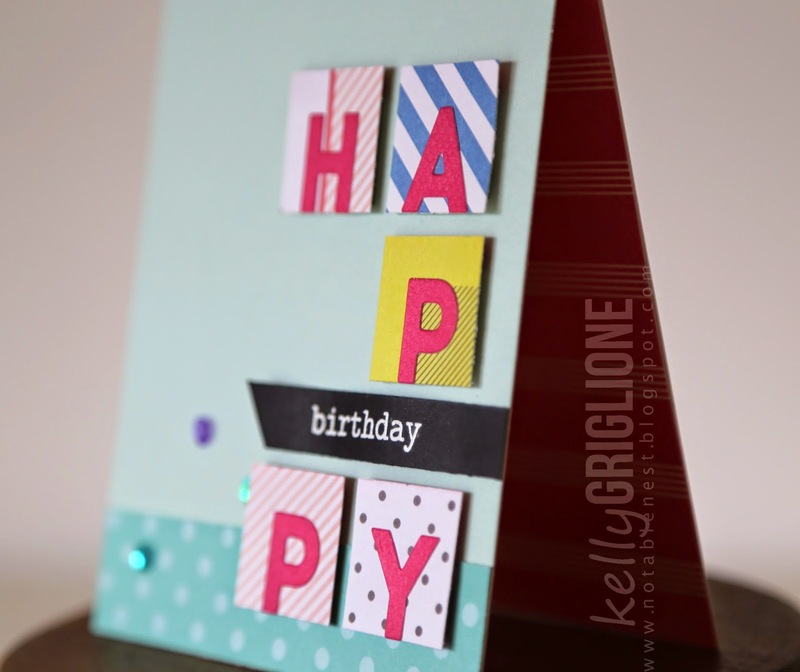 The aqua stripes on the side are half of a Winnie & Walter Scenery: V for cheVron stamp. I've also used the baker's twine that Winnie & Walter so kindly use to package their stamp sets (I never throw anything out!) I finished with a few seconds to spare, but after taking a photograph of the tag I thought it was still missing something so I added my go-to clear sequins. That got me right to 10 minutes. 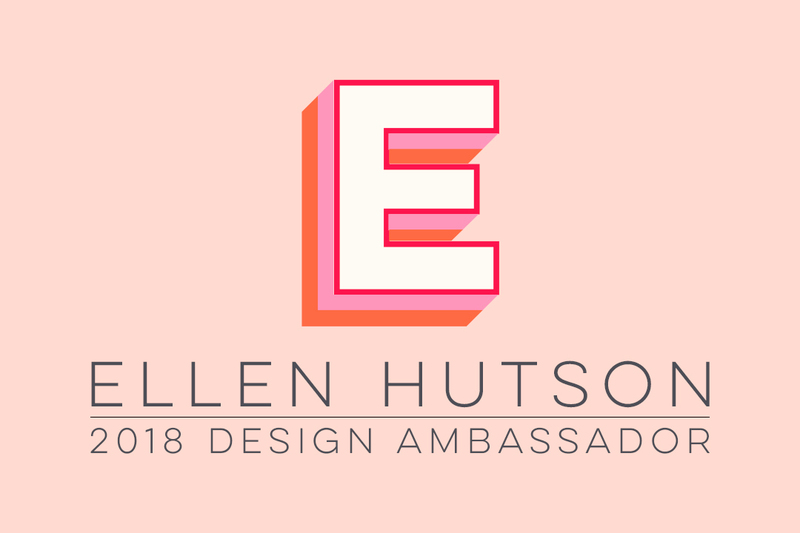 Hope you have some time to play along on the blog, or just check out the inspiration from Julie, Shay and my other super-talented teammates!